Caroline's personal page, Caroline Karthaus in France, living in france, emigrating to france, caroline taylor, gers. During Spring they are little flowers, during Summer they start to appear, the fruit to be...blackberries. Being impatient, I often went past the hedges and trees around the property and neighbouring farms to see if the fruit had already ripened enough for me to come back with baskets to pick some. Finally, the last few weeks, it was party time. Risky business sometimes too though, near-hits with vipers sunning in the hedges, dodging big prickly blackberry branches, you name it... what an adventure! 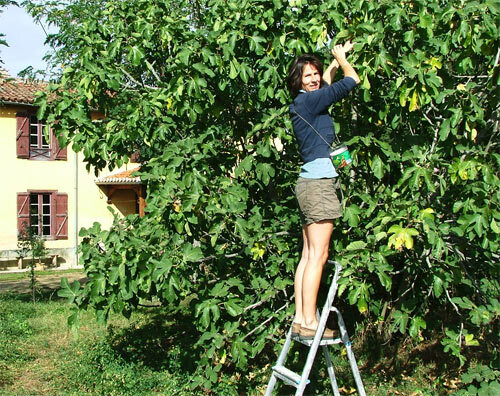 We also have a big fig tree in front of the house, which produces an enormous amount of small black fruit. During this time of year it is a very noisy tree too. It is full with flies, wasps and hornets, all attracted by the sweet fig flesh. Yummie. 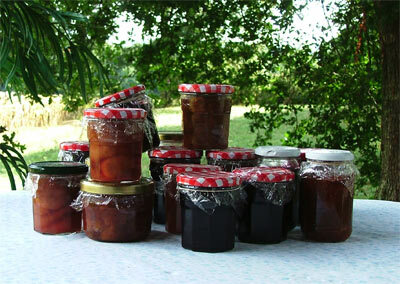 Luckily I had warned my parents who were here for two weeks that it was jam time, so they came armed with special jam sugar and lots of empty jars. They are professional jam producers, so it was a joy to be in our tiny kitchen with them, turning all that sun ripened fruit into delicious confiture. I cannot reproduce any recipes, as we invented them as we went along, but a suggestion might be to add a little fresh stem ginger to the fig jam, it makes it a little less sweet. And for a special blackberry jam, add a sliced and deseeded vanilla pod in the pan during the cooking process... Perry can't get enough of it!